The 2018 general election is approaching fast, and nothing signals its arrival better in Oregon that when ballots hit the mailbox. That should happen during the next few days. 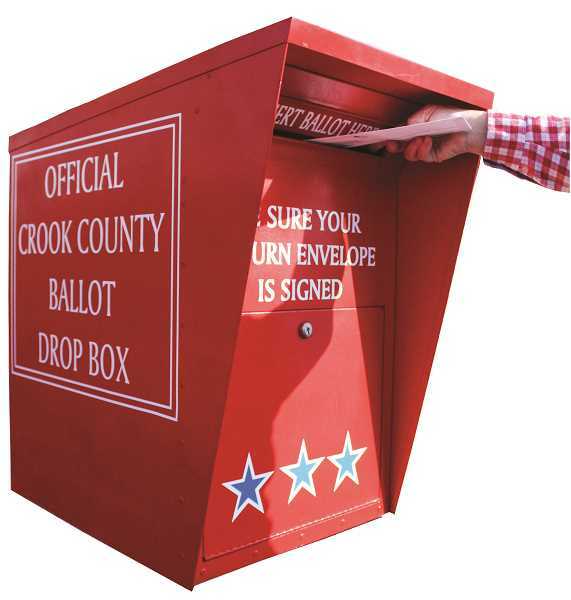 Crook County Clerk Cheryl Seely said that ballots went to the post office for distribution on Wednesday — if you haven't received one within a week of that date, contact the Clerk's Office. The local ballot will feature numerous offices and ballot measures from the federal to the local levels. Crook County voters will help decide who represents Oregon's Second Congressional District and who leads the state as governor, as well as the outcome of five statewide ballot measures. The race for Oregon House District 55 will also appear on the ballot, as will one Oregon Supreme Court Judge race, candidates for three Oregon Court of Appeals positions, and the race for Oregon Tax Court Judge. Locally, several candidates will appear on the ballot. Voters will elect a county clerk, treasurer and district attorney as well as the judge for position 3 for the 22nd circuit court district, which serves Crook and Jefferson counties. The lone ballot measure for Crook County voters to consider is a continuation of the Bowman Museum operating levy, a tax of 6 percent per thousand dollars of assessed property value. Voters within the city limits will also elect Prineville's mayor as well as three of its city councilors. None of the candidates for any county or city office has an opponent. As the election approaches, Crook County has an all-time high number of registered voters, 17,182, as of Tuesday. Seely acknowledged that voter registration numbers have surged considerably after the Motor Voter law took effect in 2016. The law allows automatic voter registration for people who visit the Department of Motor Vehicles to apply for, replace or renew an Oregon driver's license, identification card or permit. Though the Motor Voter law explains much of the uptick in voter registration numbers — which have risen by nearly 5,000 since the last mid-term general election in 2014 — it is not the sole reason for the increase. "We have had a lot of folks come in and apply with a hand-written (registration) or want to come in and check their voter registration," Seely said. "Some we find aren't registered for whatever reason. We have had a lot of in-person updates this week and last week." Voters who want to mail in their ballots are encouraged to do so until about one week before the Nov. 6 election date. Seely cautions that after that timeframe, it may not arrive at the Clerk's Office in time to be counted. Those who choose to drop off ballots can visit any of several sites prior to 8 p.m. on election night. Sites include the Clerk's Office and drop boxes at the Crook County Courthouse, county tax office, Powell Butte Community Charter School and Post General Store. "Don't forget to sign your return envelope," Seely added. Election results will be posted on the Crook County Clerk's website as soon as possible on election night following the 8 p.m. deadline.